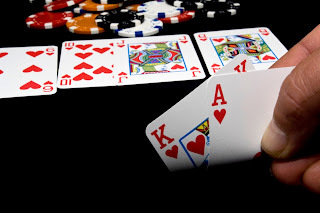 I played Texas Hold'em for a few years in the early 1990s at informal poker nights and had a lot of fun. Usually I went home a few hundred dollars up or down, mostly down to begin with. Then I became a full time research student. Suddenly I had tremendous freedom in what I did each day with enough scholarship income to avoid hunger. It was a joyous time where I could pursue anything I found interesting and this gave me an opportunity to improve my game. I looked for information on strategy and odds. I found only meagre resources in the libraries I searched but consumed what I discovered. The internet was barely functional then, no web browser and no way to search but I did discover a no money online multiplayer Hold'em game and it was a great resource for procrastination. Gradually I improved so that I went home from poker nights in front more often than not. Not from a thorough understanding of probabilities and strategy but from an intuition developed through practice. There is a lot of luck in no limit Holdem so winning or losing over a short period is not a good indication of skill but as I got better I formed the view I was second to one other player who, like me, turned up for every match. A poker night would last for hours but nearly all the money would be won in a few hands and the evening's outcome was determined in a few crucial seconds. I had worked with my nemesis when we were hired as contractors for a complex technical project. I considered he had insufficient humility to abandon a priori beliefs when evidence required it and an unwillingness to persevere when a problem became difficult which led too often to failing to solve the problems we were working on. We remained friends though, and he went on to a series of sales roles in high profile technology companies, excelled and became wealthy. I could often build up my pile during the grind but too often he took me on the big hands. I'd sit there quietly, drinking little and focusing on the game while he drank heavily, kept up a banter that included what was in his hand, his strategy and what we should all do. He was a great raconteur and sometimes played hands without bothering to look at his cards. He seemed easy to beat. He would tell you, who had the best hand then raise against them and as he predicted lose. As far as I could tell he never lied. There were several times he had nothing, told me so, raised against me and lost. I could trust him, would follow his advice and win. Yet too often on those few crucial hands, he took the pot. I don't think he bothered too much with theory or probability, he just got inside your head. The most painful experiences were when, confident I had the nuts, I'd put all my effort into aggressively building the pot. I'd be pleased at my success only to discover my error at the showdown. The sense of being played by a drunk was emotionally devastating, I could never be sure if it was luck and that uncertainty further reduced my self belief. I no longer trusted my judgement and played too passively. Leaving money on the table is easier emotionally but over time is as expensive as overconfidence. My drunken nemesis would advise me to be more aggressive and while the advice was good it would unnerve me even more. Just occasionally he would be drunk enough to barely function and then I'd have a chance. High volatility made outcomes for a particular evening difficult to predict but over time all players would form a view of their relative ranking and persuading those who ranked lowly to keep turning up is difficult. Some low ranking players, like me, would try harder and improve but most would give up. The best new players were those suffering the Dunning Krueger effect and volatility could hide this from them for quite a while. Even then though, a constant stream of new players was needed. Eventually we ran out and poker nights came to an end. I find casinos entertaining. I don't delude myself I can win, but observing my own emotions and my success or otherwise in remaining objective and particularly watching the emotions in others is fascinating and fun. 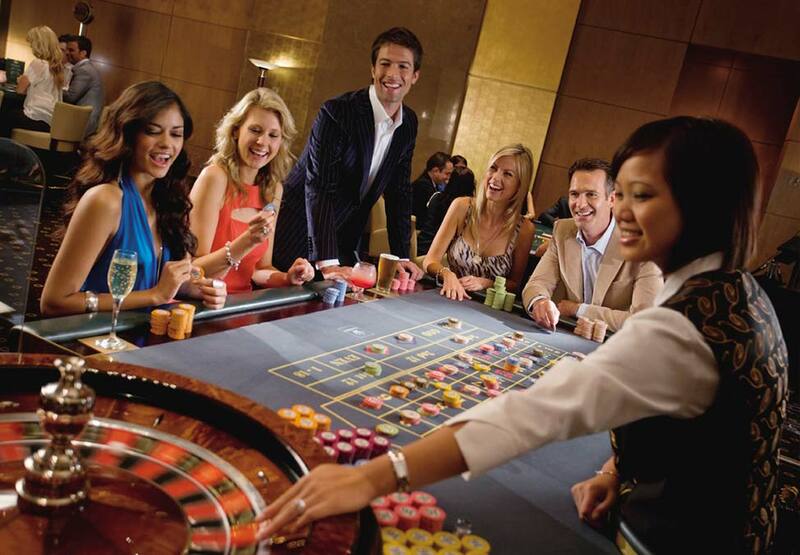 With roulette, there is human interaction and thinking doesn't help, so you can ignore the game and have fun observing others and playing with your emotions and theirs. Elaborate pseudo strategies will impress friends when you win. You can wax lyrical on almost any topic and be taken seriously but you lose all respect when you wipe out. How weird is that when it's not your wisdom or lack thereof but down to variance? To maximise variance and therefore respect or contempt, bet on single numbers and walk away after a win. In the Canberra Casino there is a Hold'em game. There are no women there and the players are mostly unkempt but these guys are the elite, the gods of the casino. I look over from the roulette table jealously, want to sit with them and recapture the fun of those poker nights of yore. Unlike roulette though, it is a game of skill. That table is no place for illusory superiority and the stakes are high enough to inflict serious injury. The internet resources available now are awesome though, so with sufficient effort it should be possible to develop the necessary skills. Odds calculators, play analysis software and realms of strategy advice. Of course the resources are available to everyone so the standard of play must be much higher than back in the day. No longer could Chris Moneymaker arise from obscurity and turn $40 into $2.5 million. Online practice is now a basic requirement rather than an opportunity to develop an edge. I'm not sure I could be bothered to put in the required effort but perhaps working at it with a friend would be fun. I believe I could have matched my nemesis in online play but face to face is a different, superior skill. I tried for a poker face but strong emotion is hard to conceal. Only face to face do you feel the depths of despair when you are owned or experience sheer joy if you successfully throw off the yoke. Only then are you happy when your opponent consumes another drink. Thou shalt not covet thy neighbours oval. Clubs can make a great free office with lunch and coffee only a few steps away. Select an out of the way table, connect to the WiFi, a mobile phone and your virtual office is complete. It is comfortable, it's free and I can practice my billiard skills for a break. I'm not unique and I often see others beavering away. Clubs lack privacy though which made for a fascinating spectacle when a real estate adviser took the next table. Their team runs seminars, mentoring workshops and personalised advice sessions taking about an hour per client, which I was witnessing. The adviser, based in the Gold Coast was in town to service Canberra clients. Clients bare their souls, are given life coaching and it is all very pleasant and aspirational. At some point it usually becomes apparent achieving the client's life goals will need more wealth than they are likely to accumulate from a salary and the coach shows them how the problem can be overcome through leveraged real estate investment. The first client was living the dream. Single, young with an exciting job that paid an eye wateringly large salary. He was planning his first purchase and I could see the merits in the consultants arguments. Land just sits there and others give you money to make use of it. You might have to put a building on it before they will but most of what they pay is for the use of land that was just there. How wonderful is that, far better than working for a living. The only difficulty is getting control of it in the first place and the consultant can help with that. The next couple worked seasonally on the ski fields, baby sat their grandchildren overseas in the off season and had $25K outstanding on their credit cards. I'm thinking, stop wasting her time, but they got as much coaching attention as the dream guy. Get permanent work and pay down the credit card, then come back, was the gently delivered take home message. The next guy had two properties already, had paid a deposit on a third and had been refused finance so couldn't settle. It seemed like disaster but he was confident his life coach would sort it out and while she seemed more concerned than the client, she promised she would. I too was working on real estate and my project was to try and save our local open space. Our government is considering giving some of it away for free to the shareholders of a public company and I could barely believe it was even being considered. 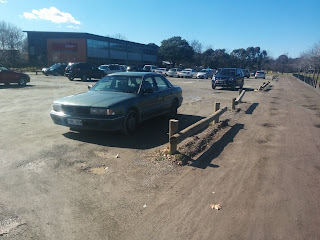 I'd assumed when this eyesore car park took over part of the local oval a few years ago it was built on land that the neighboring company had always owned. Car park usage on Thursday 13 August, a normal school day. It gets a lot more vehicles through it at pick up and drop off times as a large proportion of the school community is not local. I had heard they hadn't had to go through any planning permission because it was paid for from building the education revolution (BER) funds and so that these could be spent fast the government had exempted BER projects from normal planning requirements. In my view they had taken advantage of the exemption to build something so cheap and ugly that it would surely not have been accepted through any planning process. When dry it is dusty and pot holed and when raining becomes muddy enough that walking there will leave shoes caked. 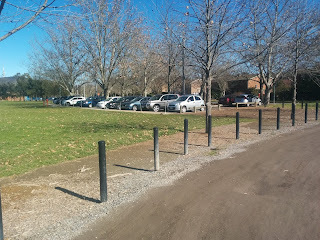 The picture above shows the level of usage on a normal school day and because it is not nice, the nearby government car park is used preferentially as shown in the picture below, taken at the same time. This image taken at the same time as the previous image shows that the nearby government car park fills preferentially. Even though it is a little further to walk, it is bitumen, properly maintained and nicer. All we saw was graders turn up one day and spread gravel across our oval to build the eyesore dust bowl. I was pissed. Just recently I learned that not only did they beat the planning system to build the dust bowl but it wasn't even their land. They had been given a chunk of our open space for free. Based on nearby property values this huge area of 7760 m2 would be worth about $8 million if used for single dwellings and a multiple of that for a unit development. It was a common view at the time that it was their land as attested by the first comment on an "Anyone else angry about the Lyneham Oval?" (archive) discussion in 2009. Technically it might already have been as they may have been given the land a few years earlier. The explanation (archive) from Brindabella Christian Education (BCE), trading as Brindabella Christian College, is that "When the two storey Senior College building was developed a few years ago this was only made possible by the ACT Government entering into a 20-year Sub-Lease with Brindabella for the adjacent oval precinct land allowing for the necessary parking the College required to then be able to build to the extremity of the existing College site boundary." That might also explain why the car park is so much bigger than would be required to meet school parking needs. After all when you are getting valuable land for free you might as well grab as much as you can get. How they ever got a large chunk of oval in the first place, why they got so much and how they did it without the neighbours finding out deserves further explanation in my view. I'd thought that sort of thing just couldn't happen here, Canberra is famous for restrictive building rules. I was shocked that our leaders had given away a valuable community asset for nil consideration. 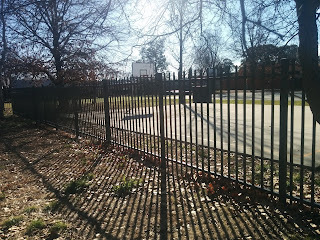 There was a time when some of the facilities, for example the basketball courts owned by BCE, were easily accessible to the rest of the community but fences around schools have become fashionable so BCE joined the fad and the community lost access. The basketball court behind this fence was previously available for community access. 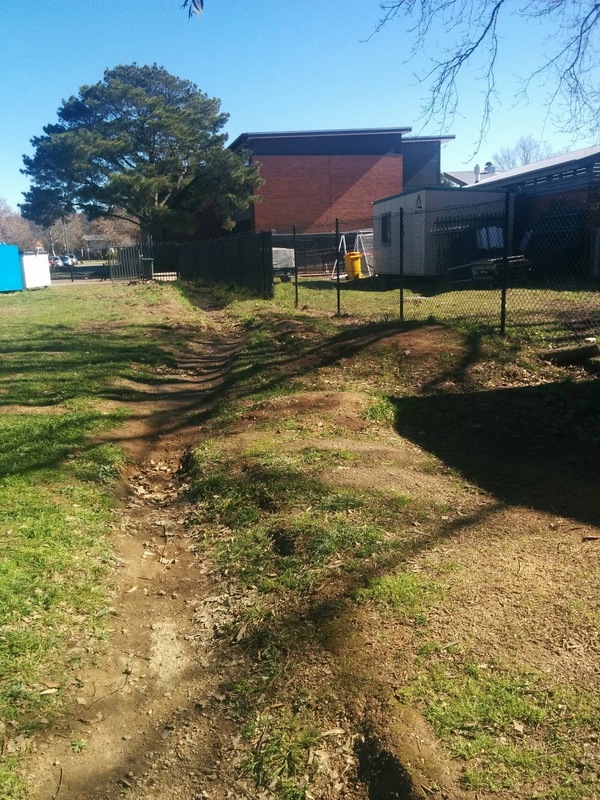 The BCE fence creates a clear delineation between what the Lyneham community can access and what is for the exclusive use of Brindabella Education's School community. It emphasises the them and us of Brindabella Christian School. 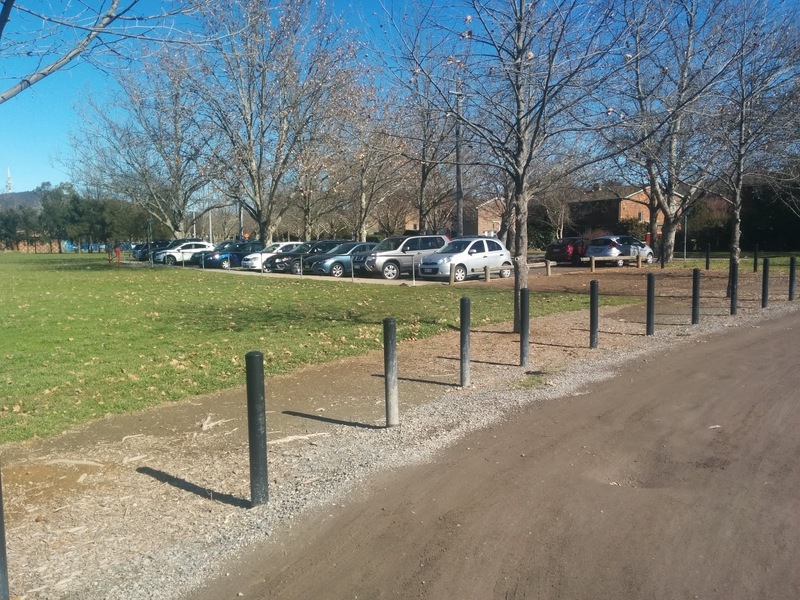 In the general community accessible area is the BCE rubbish facility, an open drainage channel for BCE storm water runoff and the eyesore car park. Behind the fence are the facilities available to the school community. Brindabella locates their waste facility outside the fence, on community land. An open drainage canal runs along the outside of the Brindabella Christian Education fence. Outside the fence Brindabella share the public land along with everyone else which is nice to see. Though perhaps it is surprising that they do when they call it (archive) a "bindi laden dust-bowl". Bindababella Christian College students using the oval. The dust bowl, or mud bowl when it rains, is however an appropriate description of the little used car park where once the oval extended. Children play sport beyond the dust/mud bowl car park, which is too big for the number of cars using it and was once part of Lyneham Oval. So it is quite clear that whatever they promise when getting public land for free, it all changes once they get it. This matters because, now that they want more free land, the government on the developers behalf is advocating for them when Ms Priest from Sport and Recreation said "This proposed new facility will be a great asset not only for the three schools in the area but also for the local community, and will come at no cost to the territory." There is a lot of doubt what those of us outside the school community would ever get from the current proposal. The minister explains "there is certainly an intent to have a written memorandum of understanding"
which is further explained (archive) as "an arrangement that will be formalised under a Memorandum of Understanding (MOU)". An MOU is usually entered into early in a negotiation phase because MOU's create expectations but are unenforceable. In this case there isn't an MOU but an intention to create an MOU, so the Minister is happy to give away public land with an intention to create unenforceable expectations despite the past failure to perform. If the new building is built on BCE land there is no suggestion of public access. At the first public meeting we were told the likely alternative on BCE land is at the front of the school and at the second next to the Motor Inn where some existing buildings were old and due for demolition. From BCE's point of view this is a hard nosed trade off, public land in exchange for public access. Yet somehow the minister thinks an intention to create unenforceable expectations is sufficient to protect the public interest in exchange for millions of dollars worth of public land. The minister continues "and then the ACT government remains the lease holder with Brindabella Christian College as a sub lessee and so if there are any changes that the government didn't agree with the government of course always has the right to withdraw the lease." Pull the other one! Sport and Recreation couldn't get them to seal the car park, they will never take back the land once there is a building on it. Nominally all land in the ACT is leased from the state, though land is effectively freehold. No one looks at the lease terms when they buy a home and that makes sense, a state government that tried to take back people's homes would be voted out in an instant. It makes less sense in other situations though and can lead to perverse outcomes which present great opportunities for developers. The heart of any community is volunteer, community and sporting groups. These groups provide important services to their members, need space to operate and couldn't exist if they had to rent that space from Westfields or some similarly profit motivated landlord. To support these groups the government frequently leases them land and charges concessional or nil rent. Lease and zoning restrictions restrict land use to the particular activity envisaged. Community groups come and go, sports grow and decline in popularity and in theory the land will be returned to the state when the lease ends. In practise though a lease of any kind over land in the ACT is forever. Sporting/Community groups frequently have the use of land that is worth many millions of dollars if it could be used for residential or commercial purposes. These groups can have various formal structures and this includes being a public company where the company share holders ultimately own the land. These groups like everyone else in the ACT with leased land regard it as their own and eventually lessees want to generate income from the land they control and become property developers. It is generally accepted that a prime lease is equivalent to freehold but sometimes land is subleased, where the prime lessee is the Sport and Recreation Department. Sport and Recreation claim when I have asked them at public meetings that land subject to this type of lease is different and will eventually be returned to the state. Mark from the Sport and Recreation, in a meeting on Friday August 20, to explain the plans for Lyneham oval said there were occasions where sub leased land hand been recovered from lessees but conceded it was not common. Sport and Recreation's views are not even shared by BCE who are using the argument that land previously leased to them for free to be used for car parking, belongs to them. In the BCE brochure distributed via letter box drop, they mount the argument:- "The much quoted 1550 people strong petition against the project alludes to the "future" sub-leasing and development of the Lyneham Oval by private interests, ignoring that the Sports Pavilion would be 80% substantively built on land already leased to Brindabella Christian College by the ACT government until 2029 with lease roll over provisions." Sport and Recreation are asking us to believe something patently false where even the developers are arguing that once you get land under any terms it is yours forever. Why is that? Even if Sport and Recreation thought a car park was desirable, there was no need to give the land away. They could have allowed it to be built on our oval using BCE funds but because they leased the land to BCE, it is now in BCE's view, their land. It is impossible to know when a group initially seeks land what they will eventually do with it. Even those seeking the land often don't know as the group changes over time but it is highly likely when ACT leases are in practice equivalent to freehold that eventually the land will be privatised. A current example is "holes 19 to 27 of the Woodhaven Green club" which are being developed as town houses, another is Canberra City Bowling Club which was sold to a developer planning to "create a 'village-within-a-suburb'" and in Lyneham at the moment the whole process is on show in three different developments. These being, Next Gen, a recently completed sports facility, a childcare development on the Hockey Centre site currently wending it's way through an approval process and of course the land acquisition phase on Lyneham oval. Tennis ACT got some land years ago and recently partnered with Next Generation Health Clubs Australia Limited, an Australian Private Company. From the Next Gen website you could get the impression that it was a club in the sense of a community group but their advertisement for a General Manager leaves no doubt where it says (archive) "Reporting to the COO, you will be responsible for providing leadership and overall direction of all operations along with: Evolving and directing the business strategy to enable the Club to continue with its long term growth, aligned with strong profitability and cash generation". I visited Next Gen to see what the public gets. From the outside it looks nice but only members can get in. The public are kept out by the gate pictured below. Entry to the Next Gen sports facility. 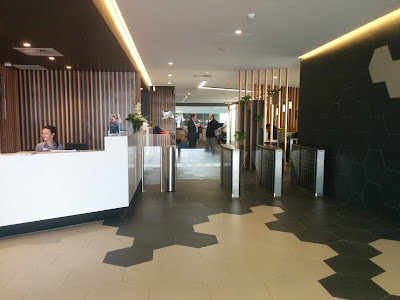 The receptionist told me only members can enter. Even the coffee shop which can be seen beyond the gates is inaccessible. This seems quite extreme for a facility on public land. Some of the facility is tennis courts which are presumably accessible without joining Next Gen but to the casual observer it looks like the whole facility is Next Gen. I could have booked a tour aimed at signing up new members to see more but didn't. I don't know the terms under which Next Gen get to use the land but casual observation suggests it has been privatised as effectively as the land our homes are built on. A daycare facility to be built at the Hockey Centre is a proposal currently wending it's way through the approval process. Next Gen and the Lyneham oval proposal requires wading through and interpreting marketing material, and most of the interesting stuff is not accessible. Hockey is up front and provides an informative power point presentation and project narrative which cuts to the chase. Their goal is to maximise their revenue. At a poorly attended public presentation they said their first idea was a sports medicine facility but they felt the zoning change would take too long and a child care facility could be developed faster. For the Hockey Centre, the child care facility is a virtual development which removes obfuscation and makes it simple to understand. They get the necessary permissions from the ACT government and flip the land to Kids Club, a commercial daycare provider on a 20 year lease with a 9 year option (slide 11) who builds the facility and pays for the privilege. I'm a little confused on the exact amount they pay and the payment schedule but the slide pack (slide 10) says "$2m capital works @ NHC, $3m childcare" and my notes from the presentation say "$2.7m pitch replacement and $3m sinking fund" so for discussion purposes lets use $5m. The slides also explain that this is the first development with more to follow, including another gym. Gifts from government in the form of public land is off the books in that it doesn't have to appear in a budget or be considered for value against alternative uses of government funds. In this case there will be even be documentation to show the recipients paid market value. The profit emerges by magic. Government doesn't have to justify the expenditure and the recipient doesn't have to account for how they spend the money. While the developers are generous in explaining their plans, almost no one actually turned up for the presentation or knows anything about it. I wouldn't either if my awareness hadn't been raised by the Lyneham oval give away as I'd normally rely on our bureaucrats and elected representatives to protect our interests. The Hockey Centre proposal explicitly states their "desire to remove ongoing reliance on ACT government funding" (slide 4) but this is only achieved by getting much bigger government funding in the form of a capital transfer. Of course, once you get the windfall what you end up doing with it is up to you. The mechanism in this case is described briefly in the slide pack and some further information was provided at the public presentation. The full hockey site of 41,000 m2 is currently held under a concessional lease until 2099 (slide 6) and the land is valued at $520K (verbally at presentation). The valuation must be on the basis that the land can only be used for hockey as nearby building blocks of 500 m2 sell for about $500K and this land is 80 times bigger. This suggests the land is worth about $41 million if it could be used for detached housing and would be a multiple of that if it could be used for higher density housing. It was explained at the meeting that to build a day care centre they must deconcessionalise the land on which it will sit for which they must pay market value. On the face of it the requirement to pay market value would kill the proposal as the Hockey Centre are merely land flipping and if you pay market value one day and flip the next at market value there is no profit. Market value is what Kid's Club is paying the Hockey Centre but to generate the magic $5 million when the land is flipped, the market value that the Hockey Centre pays the ACT government must be on a different basis. Not only do land beneficiaries get their land for free but the planning process is subverted. At one level there is a Territory Plan for housing here, retail space there, industrial activity somewhere else etc. but when land is acquired for free none of this matters and allowable land use is changed to suit the land beneficiaries. While to me the Hockey Centre looks a great place for a child care centre as it is on a commuter route with good off street parking, it certainly promotes car use and the motivation for siting one there is profit maximisation for the existing lessee rather than better child care or what would be the best use of that public land. Under these circumstances developers can get public land for free with more freedom on how they use it than if they purchased commercial land. The first public meeting in Lyneham, I've heard of despite living here for about 17 years took place at Brindabella Christian School. During the architects presentation they said, among many provocations, that if BCE didn't get the oval they would build their new building next to the road where it would be ugly and there was nothing anyone could do because schools do not require development approvals. At that stage it was the Department of Sport and Recreation's Development Proposal, endorsed by BCE and the department was there. The proposal presented didn't pass the sniff test, there were several hundred people that thought so and the mood was vicious. BCE describes this mood as "people simply resorted to shouting and personal attacks, drowning out any form of civil conversation on the issue." I didn't think it was that bad but I did think that would be the end of it. Months later there was a second public meeting at Lyneham High School where some variations were presented. This time there was only about a hundred people and the mood, while less confrontational was similarly opposed. The Sports Minister, Shane Rattenbury, spoke and said he saw merit in the proposal but was mainly seeking to gauge public opinion. He expressed concern that the audience may not be representational of the wider community. BCE argues "the information session was attended and hijacked by vocal opponents stifling any possible genuine discussion." and that "The generators of the petition have resorted to strategically attending and disrupting any community discussion" but until this public meeting there was no organised opposition, the anger was spontaneous. I was shocked that despite what the minister was saying the proposal was being presented as a fait accompli. The minister was pointing out the positives - there is a need for more community facilities of this type, this land (in his view) was neglected and the ACT's budget position meant that the $1 mill. capital required to irrigate the oval would never become available. One audience member said the sprinkler system, which hasn't been used for years, had been tested a few months earlier and only two sprinklers failed to operate. It seemed unlikely that BCE would be tipping in $1 mill. into oval irrigation so when I got the opportunity later on I quizzed the minister on this and he said he was merely quoting from figures provided by the department of what it would cost them. I pointed out the improbability of BCE spending $1 mill. and he was unconcerned whether the figure he quoted was unrelated to what BCE intended to spend. I was later told by Mark from Sport and Recreation, in a meeting on Friday August 20, that there was an intention to use bore water rather than potable water to reduce watering costs but there was no commitment for any particular spend or specific design from BCE. Perhaps all that BCE will do is connect up a bore and pump to the existing piping, who knows. Later on the minister doesn't mention the figure but Sport and Recreation still maintains (archive) BCE's "recommissioning of the irrigation system" is a principal feature of BCE's proposal. Also featured again are basketball courts, referred to as "outdoor sport courts" on the Sport and Recreation web site. One audience member sensing the danger said straight up, how do we stop it and got no clear answer. That person later approached the minister suggesting, if there was doubt as to the extent of community opposition the government should survey the community and the minister dismissed the suggestion. This person took up the challenge and initiated a petition which read "The following residents of the Australian Capital Territory draw to the attention of the Assembly the potential loss of Urban Open Space (PRZ1) in Lyneham through sub-leasing and development, in particular by the current proposal to sub-lease and develop Lyneham Neighbourhood Oval. Your petitioners, therefore, request the Assembly to prevent further loss of Lyneham’s Urban Open Space by (1) not entering into further sub-leases of Urban Open Space to any business enterprise, (2) not allowing further development on Urban Open Space by any business enterprise, and (3) not rezoning any land currently zoned Urban Open Space for the benefit of any business enterprise." With help from a few other people he collected 1550 signatures, perhaps the biggest petition ever in the ACT. The text seems pretty straight forward but Minister Rattenbury didn't think so when he said "I do take some issue with the petition that was out there. I've seen it, I probably would have signed it because it says do you object to a private enterprise being able to develop on an oval, and when you put it like that, yeah I'd probably sign it too. Ah but I think it is a more nuanced discussion than that and I think it is worth trying to have a more nuanced discussion." Of course Minister Rattenbury had seen it, he tabled it in parliament, and by inaccurately quoting from it he was subtly suggesting the signatories have been hoodwinked. Minister Rattenbury says "I don't particularly want to put a view we are just starting a public consultation process today to try and gauge the community view." So after two public meetings and a huge petition we are just starting the public consultation process. Really? How will public opinion be gauged? According to Minister Rattenbury "To try and help the government get a clear sense of where the community is at on this proposal we are trying to be very open in putting this out to a community survey and so all residents of Lyneham down to Macarthur Avenue and even though some of that's O'Connor it is really part of the community ahh and all the parents of the three schools are being sent a survey to ask them their opinion and this will, I guess, give us a really objective and measurable ahh. Because one of the questions I was asked at a recent public meeting was how does the government decide what is a meausure of community sentiment. That is a really good question and one I've given a bit of thought to and a public meeting where 100 people turn up, is that a full measure of the community sentiment or is it just the really motivated people that turn up to a public meeting but the rest of the community has a different view so we are trying to get that broad community sense." The minister issued a similarly worded press release press release (archive) where again he says "The survey is open to residents within the Lyneham area, and parents/carers of children who attend any of three schools." This survey turns out to be online using a commercial tool which is totally inadequate for surveying opinions on anything controversial. Registration requires only an email address, multiple registrations are possible and even with the same registration it appears to accept multiple votes. There is no way to restrict voting in the way the minister claims. Perhaps his claim relies on the Do you live in: check box on the voting form. Survey integrity was questioned at the Sport and Recreation meeting on Friday August 20 at Lyneham Primary School. Ms Jenny Priest, Director Sport & Recreation Services and Mark said they would use voter IP addresses to ensure integrity. Questions asked included; is it to be one vote per IP address, does that mean more than one person can't vote from one house, does it mean votes when people are outside their home are invalid? They couldn't answer. IP address is a notoriously poor method of geolocating someone and a contract issued on Mechanical Turk could get as many votes as you wanted for your favourite case from unique IP addresses. As a tool for seeking feedback on controversial issues it is a joke. It requires a lot of effort to find and participate in while allowing voting from anyone, multiple voting, voting from anywhere and has propaganda for the yes case only, on the voting site. For example it says (archive) "Given that the proposal is wholly funded by BCC, it will only proceed in its entirety" but at community meetings we were told the building would be built regardless. Compare this to the electoral commission which maintains electoral rolls, makes sure people are entitled to vote, there is only one vote per person and which doesn't run propaganda material from one side of a debate. Minister Rattenbury said "I do take some issue with the petition that was out there." and then followed up with a consultation process which is farcical. The petitioners list their name and address and this offers huge opportunities for checking and analysis. If you doubt the validity you could even ask some if they really did sign. An interested government could also ask some petitioners why they signed. Analysis by address would be really useful. I collected about 100 of the signatures going door to door and my experience was that a lot of people weren't home. Of those that were, more than half didn't know anything about the proposal. After some background explanation most of those signed and of the people that were already aware, well over 90% signed. Objections to signing, though few, were varied, often vague and sometimes seemed based on an unwillingness to engage with door knockers. I came across two people who said they had children at Brindabella School and one was keen on the development and the other opposed on the grounds that their children would be there only a few years but the oval would be gone forever. While Minister Rattenbury in his public utterances claim he is mainly seeking community feedback BCE have advised he is far more committed than that where they say (archive) "Due to concerns of the Minister Brindabella agreed to withdraw the previous DA to engage in further public consultation on an offer by Minister Rattenbury to then fund our resubmission following further consultation" Actually BCE come across as annoyed that what they saw as a firm commitment from government has become less so where they argue (archive) "Originally our Sports Pavilion proposal had the then support of Minister Andrew Barr as Minister for Sport & Recreation and Minister Joy Burch as Minister for Education. In the more recent portfolio moves the proposal has now fallen to Minister Shane Rattenbury as the Minister for Sport & Recreation. Ultimately though it is the Greens that matter as Minister Rattenbury holds the balance of power in the single chamber ACT parliament. Nothing can happen in Canberra without Greens support and in this case, according to the developer, Minister Rattenbury is so committed that the developers reported he agreed to "fund our resubmission following further consultation". Minister Rattenbury's constituents can only deploy their own resources to try and save our public open space from being given away for free and Minister Rattenbury is trying hard to ignore them. This begs the question as to what our politicians are up to. First they think giving away public land for free is acceptable, then in the case of the car park land they do it without telling their affected constituents and when people object they remain resolute. They are also doing it all over Canberra. They have just been beaten in a developer give away in Telopea Park where "Telopea Park School's Parents and Community Association president Paul Haesler said that in this latest battle he had always been confident the Government could be pushed back because its decision was "so manifestly and obviously flawed and unfair." In this development Canberra Services Club were planning to generate cash from turning leased land into housing and the politicians fought hard against the community on the developers behalf. The underlying opportunity is that, with a plausible story, prime land can be acquired in the centre of Canberra for free. In most of Australia property developers can make money by purchasing land and then waiting or lobbying for rezoning so that it can later be resold at a higher price. Developing under these conditions requires substantial capital and a risk that you won't get a favourable rezoning. If that happens you are stuck with holding costs and will probably lose money. The ACT is much better. As the land can be acquired for free, resale is all profit. This also means no interest expense, resulting in negligible holding costs and therefore negligible risk of loss. In the acquisition phase you will have to accept restrictions that limit profitability but any promises you make will eventually be forgotten. The politicians can be persuaded to support your acquisition and in the face of community opposition, government departments will help promote your development. Then after waiting a while and some more lobbying the land use can be changed and you get to control the distribution of the profits. Spend them on a community project you care about or pocket them, the choice is yours. Our government promotes these activities as public/private partnerships. Capitalism doesn't get any better than that and the Greens can even be persuaded to spruik for you. Who'd have thought? There are several ways I can immediately think of to exploit the underlying opportunity. At the community meeting with Sport and Recreation on Friday August 20 one idea suggested was to seek the support of the neighbours in return for storage rights, to build a garage on public land near the proponents house. This would require establishing an organisation to undertake the endeavour and seems too blatant to pass the plausible story test. It also lacks ambition, a bit of isolated land could only generate modest profit. Better to think bigger. Buying shares in Brindabella Christian Education Limited (BCE) is a great opportunity. According to the 2014 Annual report there are only 6 company members (Note 18). BCE is a non profit public company which I'm told is a requirement for running a school and this presents both opportunities and difficulties. The opportunity is that shares ought to be cheap to acquire. Shares would normally be valued as a multiple of dividends so shares that can not pay a dividend by this valuation method are worthless. Of course the shares have no value to the acquirer either if there is no way to extract the company's capital but I feel confident this can be overcome. Non profits can't pay dividends but are notorious for paying out profits in other forms. I note from the 2014 annual report, "No other directors received any compensation during the year" (Note 19) but that can be changed so one technique that would work is to acquire sufficient shares to get a directorship then extract cash via directors fees. Another would be to engage a for profit management company to manage the asset. You also have to generate the cash to extract. The land is worth millions but only if you can sell it. The school is already quite profitable with $1.7 million profit on a revenue of $10.5 million (pg 39) in 2014 but extracting revenue from the school community through fees just doesn't seem reasonable. I pondered over this problem for a while and then found inspiration on the BCE website where they mention (archive) the next door "newly proposed development of the Lyneham Motor Inn which is to incorporate some 300+ apartments in twin 8-storey towers. A separate fight for the College to have as and when this proposal develops." There is a great way to win this fight, liquidate enough of the BCE land to generate a lot of cash, make it look like a new school/community asset has been created and therefore provide a good argument for the required zoning change over the BCE land. Plot ratios will limit the number of units that can be built on the Motor Inn site so expanding the land area allows more units without necessarily building on the particular piece of additional land. A joint facility using BCE land would do it. A pool and spa facility would look good in the school prospectus and would help sell the unit development or perhaps an outdoor entertainment/sport area. Continued access to this land for school purposes can be guaranteed with a memorandum of understanding. Memorandum's of understanding are ideal. The seller gets full value from the land sale because the purchaser promises are unenforceable and the ACT government regards memorandum's of understanding as sufficient for giving it's blessing to development proposals and even land grants. Buying shares in BCE is much better than the garage proposal as it is less blatant and can generate more profit, but I'm aware of an even better opportunity. I know of another community group operating on public land that is smaller than the BCE or the Hockey Centre plots but is even better located. It would be ideal for unit development which seems to generate the most profit. The community group organisers are all voluntary, driven by altruism and like most community groups that provide valuable services at less than cost, they suffer from lack of funds and free riders. A few hundred high rise units on their land to fund new facilities for the community group and fund paid staff would really get the group humming. Surely the offer from the property consultants on the next table could be improved on. 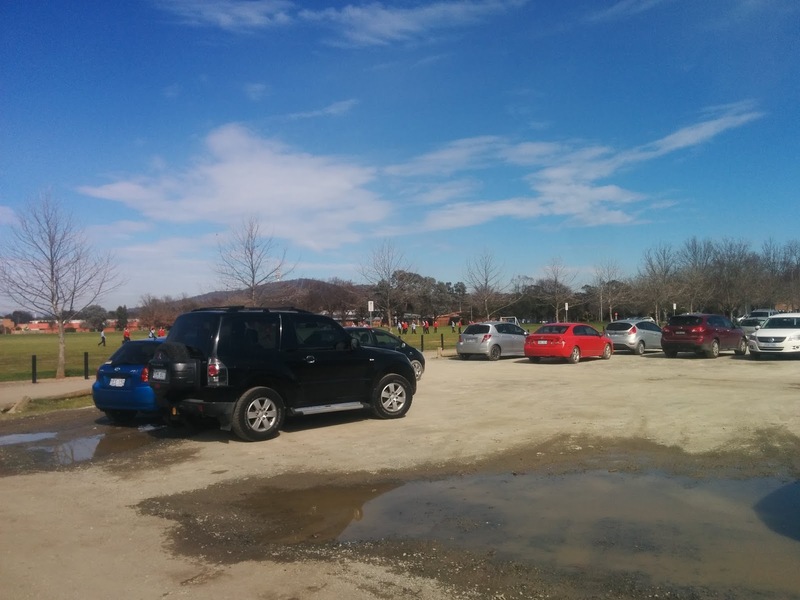 Free land in the centre of Canberra has got to be better than negative geared apartments on the Gold Coast. To capitalise on this opportunity you also need to join the party while it is in full swing. Eventually the government will run out of land to give away and while a lot of the good stuff is already gone, so far, there is still good land remaining. The site I have in mind is prime land for high rise residential development, close to shops and amenities and with water views. Just like Garden Island, Sydney as depicted in Utopia, it is a developers dream and best of all it is not in my back yard. Perhaps I can partner with the guys on the next table. They have the marketing muscle, then we need some partners who know how to win over the politicians. Someone from the Hockey Club, Canberra Services Club or BCE would be good. I'm sure these organisations are driven by altruism so I don't know if they can be persuaded to join an endeavour as mercenary as I have in mind but they have the necessary skills. There is even one person on the boards of both BCE and the Canberra Services Club. We can form a team and party hard!